Cut your timber to the dimensions shown. Assemble the tunnel and main chamber separately; attaching the feet and the hinge flap before putting the box together will make things a little easier. Don't be tempted to skip the tunnel – it means that predators won't be able to swipe their paws inside! The tunnel will be slightly shorter than the height of the opening so that it can be slotted in at an angle, making a ramp. You can also drill a hole that will fit a hosepipe into the back of the box to add some extra ventilation. Making a log pile or compost heap are also good options for providing space fro hedgehogs to nest, and have the added bonus of attracting lots of insects for them to eat! 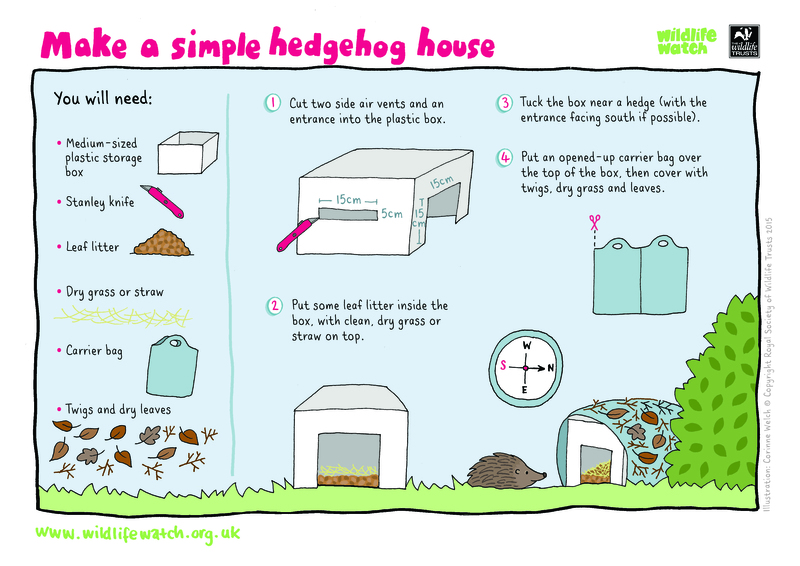 Want to create a simple hedgehog house?